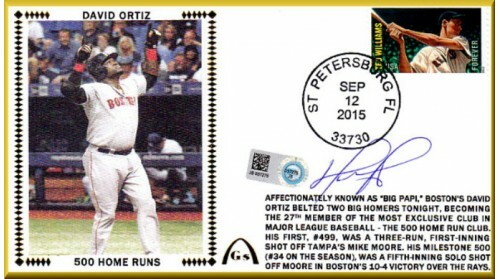 David Ortiz Known As "Big Papi" Belted Not Only Home Run #499, But #500, Tonight In St. Petersburg, FL, Becoming The 27th Member Of The 500 Home Run Club. Home Run #499 Took Place In The First Inning And Home Run #500, A Solo Shot Happened In The Fifth Inning. (2015) We ONLY Sent 30 To Get Autographed But ONLY 20 REMAIN. Buy Your Fast Because IF We Get More Autographs Our Price Could Be Higher. The Autographs Are Here And Silks Will Be Here On December 22nd.